The distant London skyline has changed beyond all recognition since Lawrence owned 18 acres of land at Pole Hill, one of the highest points of Epping Forest in Essex. 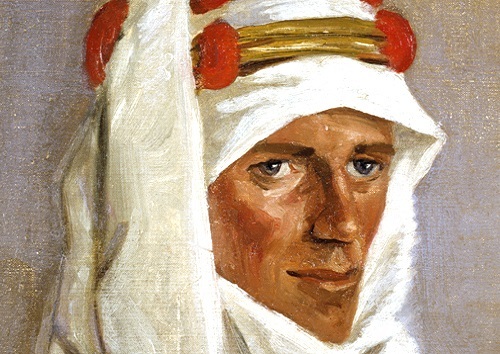 Lawrence first rented the land, then began buying it in small parcels after the war. Here, he dreamed of setting up a private press to print fine-edition books with his close friend from Jesus College days, Vyvyan Richards. Enthused with the ideals of medievalism and craftsmanship in the style of William Morris (Lawrence’s own collection of fine-press books included a copy of the Kelmscott Chaucer, now at Queen’s University in Ontario, Canada), they planned to house their press in a medieval-style timber hall to be designed by the architect Herbert Baker. ‘All the half-heroic life which appealed to Morris so strongly after his Iceland journey and inspired so much of his writing, was meat and drink to Lawrence in those days. I have already spoken of the old timbers that he rescued from a hall which our college was pulling down just then … We planned and planned to build ourselves such another hall and crown it with these carved oak king-posts and their rafters and purlins’. Richards, who had taken a teaching position at nearby Bancroft’s School, built a wooden hut on the land which burned down in 1921. This was replaced, with the help of staff and pupils from the school, with a new L-shaped wooden structure called the Cloister, with a small garden and plunge pool. But their dreamed-of venture was never to be. Richards left Bancroft’s School and moved to South Wales in 1922, though Lawrence seems to have continued to harbour thoughts of settling here, as seen in a letter to his friend Jock Chambers in 1923, giving his address as Pole Hill, ‘for it’s my ambition some day to live there and read again’. 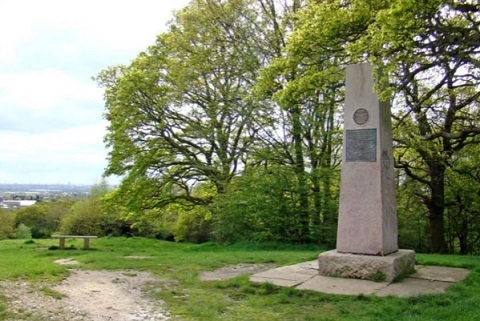 Epping Forest for exactly what he had paid for it – £3,500 – which he hoped would give him a sufficient income to live at his Dorset cottage, Clouds Hill, after he left the RAF. The Cloister fell into disrepair and to protect it from vandals, the building was moved to the Conservators’ yard in The Warren, Loughton, where it remains as a storeroom for forestry equipment. A nearby Ordnance Survey trig point stands more accurately on the Meridian. 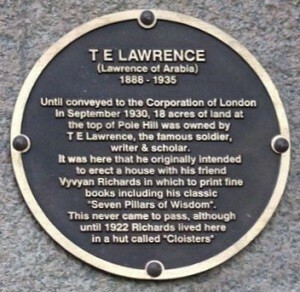 The most recent plaque records that it was here on Pole Hill that Lawrence had intended to print fine books including Seven Pillars of Wisdom, though this never came to pass. Instead, it was in a ceremonial bonfire built on the hill on May 20, 1920 that Lawrence is said to have burned his second draft of Seven Pillars. Was this the cause of a pile of old ash found by the Society’s London Group during a visit to Pole Hill in 2004?